The Ben Holder Quartet is a stellar line-up of incredible musicians, blending an energetic mix of traditional jazz, mainstream and swing with Ben’s own infectious originals,which hark back to the fun and swing of the 1920s and 1930s. The group is one of the most exciting bands to emerge in recent years. 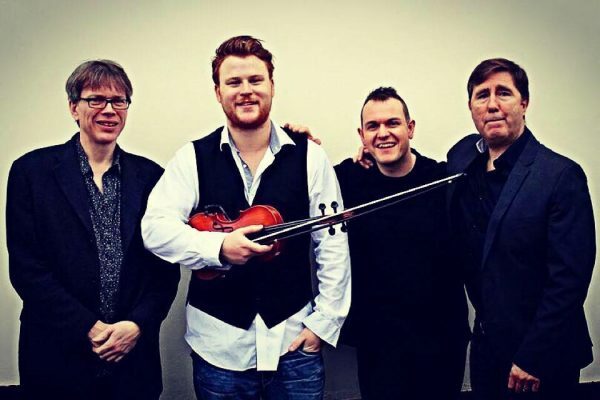 Led by the fiery enthusiasm of 26-year-old Ben Holder, who not only wows on violin but also on the keys, the quartet is strengthened by the phenomenal Jez Cook on guitar, the suave talent of Paul Jefferies on double bass and the breathtaking drumming of Dave Wilkes. Ben Holder is one of the most gifted young jazz violinists in the UK. Taught classically from the age of six, he studied at the Birmingham Conservatoire. During his classical studies, Ben began listening to jazz – classic masters such as Benny Goodman and Oscar Peterson and of course the great jazz violinists including Stephane Grappelli, Joe Venuti and the awe inspiring Stuff Smith. Alongside his early studies and later at college he embarked on a detailed analysis of these musicians’ techniques and the way in which they merged this most classical of instruments into the jazz idiom. ‘Ben Holder has the warmth and flexibility of a sax player, and all the extra possibilities of a string instrument – lightning speed harmonics, col legno, glissando and double stopping. Chilled and confident, he also has the capaciy to switch seamlessly within the same bar from virtuosic violin to vocals.’ London Jazz Review. The Ben Holder Quartet masterfully mixes old jazz favourites and Louis Prima-style swingers with more recent material and leaves audiences up and down the country shouting for more.